One of our archive volunteers, Lynne MacMurchie, tells us about what she has been working on this week. I have been volunteering at the Archive for a number of months now and today I was given two tasks; I chose the easy one first which still took me all morning to complete! This involved cataloguing “Connections”, a bi-monthly newspaper for NHS Lothian staff which was first published in 2004 - not that old compared to some of the collections here but what a great sense of satisfaction to have that all neatly catalogued and boxed. Recent editions of Connections, now catalogued. This afternoon involved me making a contribution to an ongoing project which has been largely done by volunteers who have been here longer than me. Dr. Gordon Leitch was a Consultant Chest Physician in various hospitals in Edinburgh during the second half of the twentieth century and we have a vast collection of his papers here to be catalogued, including patient files, conference papers, photos and policy documents. It is a great privilege to be involved in preserving all this fascinating history for current and future generations. 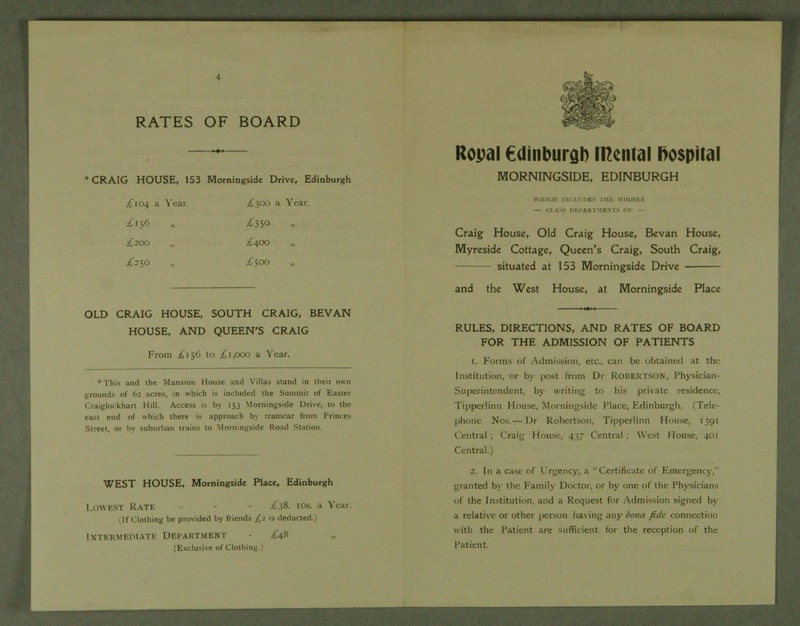 A frequently used series of volumes in LHSA’s collection are the casebooks of the Royal Edinburgh Hospital. These contain case histories of patients, written in a standard format. A feature of the casebooks is that they often have additional items inserted into them known as enclosures. These include items such as letters, charts and laboratory reports, designed to augment the information written in the book. They are usually glued or attached with metal fasteners. A decision was taken some years ago to remove all of the enclosures and house them in separate boxes; metal fasteners had rusted and damaged the volumes, and some enclosures had become loose increasing the risk that they may fall out and become separated from the relevant patient case notes. A searchable finding aid is being produced, listing each enclosure in order to improve the accessibility of these items, with information on types of document, dates, names and number of pages. 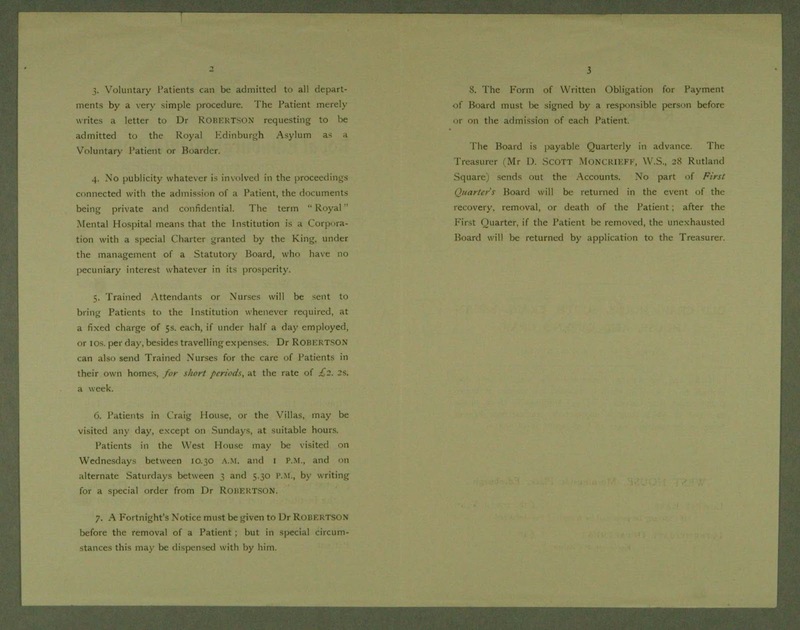 An interesting enclosure found within casebook 94 (LHB7/51/94) is a pamphlet regarding the ‘RULES, DIRECTIONS, AND RATES OF BOARD FOR THE ADMISSION OF PATIENTS’. 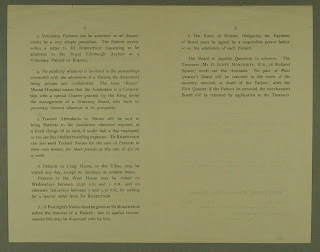 The casebook covers the years 1910-1913, and the Physician Superintendent is noted as Dr Robertson who took office in 1908, so it is assumed that the document comes from that time period. Patients were admitted to the Hospital either as ‘paupers’ who would be paid for by the parish council, or ‘private’ who could pay varying rates depending on the quality of accommodation they would receive. Patients could be admitted by certification of their medical condition or enter voluntarily. 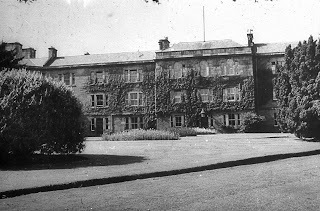 Readers of the pamphlet are told that ‘No publicity whatever is involved in the proceedings connected with the admission of a Patient, the documents being private and confidential’, no doubt trying to allay fears of patients and their family, due to the stigma that often surrounded mental illness, something that is still pervasive today. Over the course of 2011 LHSA started to work more closely with the Scottish Council on Archives (SCA). The SCA is funded by the Scottish Government to support and promote archive and records management services across Scotland, and we've been involved in a couple of their initiatives so far. Last year we took part in the pilot process to develop a scheme through which archives could evaluate their own strengths and weaknesses in a number of key areas. This was a lot of work for our team but it is hoped that this new framework will help archive and record management services meet the challenges we all face and be a useful tool to implement the Public Records (Scotland) Act 2011. On a much lighter note, we also provided the SCA with recipes from our collection for their Edible Archive. And thanks to the SCA staff we got to sample the Royal Infirmary of Edinburgh's recipe for invalid fruit tart dating from the 1950s! This year we've started to contribute to a new piece of work via our links with the SCA: a UK-wide archive accreditation scheme. The expectation is that accreditation for archives will work in much the same way as it has for museums: increasing the sector's strength and helping with planning, improving and financing services. Today Ruth went to the first of four workshops held across Scotland, England and Wales where members of the archive sector can help shape the accreditation scheme and comment on the standards that archive services will be assessed against. There will then be a period of wider consultation using an online forum. Participants came from all over Scotland and Northern Ireland, as well as from The National Archives, to take part in the session held at the National Records of Scotland. The workshop was led by a private archive consultant who has been developing the scheme for the last two years. The scheme and the work so far was introduced and then there was plenty of time for us to look at what was being proposed and make suggestions to ensure that the scheme suits all areas of the archive sector. It looks very promising so far! For more information on the scheme, including the high profile organisations that are leading on its creation, please see the SCA website. As we’re busy preparing for another packed year at LHSA, it’s also a time when we reflect on the previous year’s achievements and prepare the annual report; this includes gathering and analysing statistics. This week, I have been looking back through the enquiries database to quantify and describe the number and types of enquiries received last year. In 2011, we received nearly 600 requests for information from countries all over the world including Canada, South Korea, Sweden, and the USA, as well as the UK and Ireland. The largest proportion originated from family history researchers, although this was down from around 50% in previous years to 31%. Unsurprisingly, nearly 20% were made up of history of medicine or health enquiries, often from academics, ranging from undergraduates through to professors. There continues to be a high level of interaction with colleagues in both the NHS (often seeking information from old records), and those in other archives and libraries requesting archival and conservation advice. 12% of requests were for access to records in our reading room where our readers viewed nearly 1,300 items and our busiest months coincided with hectic times in the academic calendar: January to March and October. 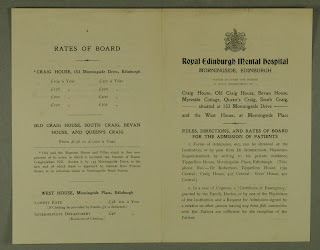 For the third year running, our most popular collection was the Royal Edinburgh Hospital which is heavily used in academic and genealogical research. As the signs are that 2012 will continue to see a high demand for our collections, these statistics from 2011 will help shape our work, such as cataloguing priorities, for the coming year.